When I was a young’n, my mother used to say about me, “Si fuera muda, explota,” meaning that if I were mute, I’d explode because I cannot keep anything to myself. I am terrible like that. When I like something, I sing its praises from every mountain. I cannot shut up about it. Well, not until someone kindly asks me to stop it, then I realize I’ve been blathering on, and finally I. shut. up. 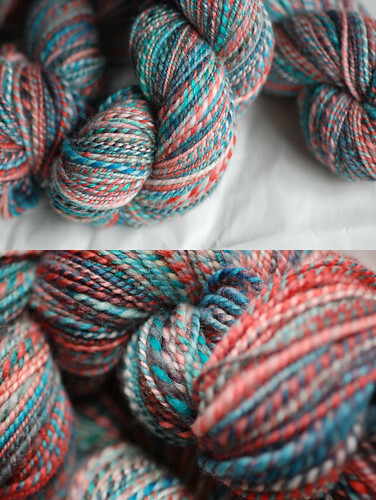 As I was casting on for the first time with handspun yarn and falling head over heels in love with it, I noticed that the date was soon approaching when Crown Mountain Farms would be having a sale of its much-coveted Sock Hop yarn. Don’t you love serendipity? I always try to get some, but I’m always too late. That’s me – always tardy to the party. It’s the story of my life! No biggie. Well, the stars must have aligned on this particular day (or maybe I just happened to show up on time for once) because I was able to snag some. Woohoo! More handspun goodness! And boy is this stuff ever so lovely. Oh the colors! The squishiness! I can’t stop fondling it. Uhhhhhh, okay, it’s not like that…. Anyhoo, I think I know what my next project will be. SOCKS! Yeah, I’ll bet that came as a real surprise. Based on this friend’s review of the yarn, I can’t wait to get started. P.S. – I am seriously telling myself that I do not need another hobby/ interest/ whathaveyou because I am soooooooooooooo curious about taking a spin class now, and I don’t mean the kind that involves stationary bikes. (Although I have tried that and liked it, strangely enough.) If I start spinning, things could get all sorts of scary. Really scary. Someone, please, keep me away from the wheel…. Last night, I spent 2 hours online looking for handspun silk yarn. Thanks crack dealer. this yarn is gorgeous! can’t wait to see what you whip up. Hm, it is the way to wisdom …the knotty bits, in the long winter nights… “All about anime…”Bifidus – the pickled!